The Romans introduced Harpastum into France around 50 BCE. 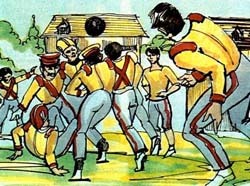 The French took the game and develo ped their own version called ‘Choule’ or ‘Soule’. Apparently the nobility called the game ‘La Soule’ and ordinary people called it ‘La Choule’. Earliest reports of the game date back to the 12th century. The game was played on Sundays until sunset and the pitch varied in length. It could be the length of two streets or the distance between two towns. The game began when the ball was thrown high into the air to represent the sun (La Soule roughly translates to sun). The aim of the game was to take the ball the length of the field and score a goal. The goal could literally be anything – a tree, a wall or even a stream. The ball was quite heavy and made with a stitched leather skin. It was stuffed with more leather and bran. Soule or Choule was often competed between two entire villages with hundreds of people playing the game together. It was a violent game and biting, scratching and punching were quite commonplace. Due to the violent nature of the game King Felipe V banned it in 1319. King Carlos V again prohibited the game in 1388, although this really did not stop the game being played in France at all.